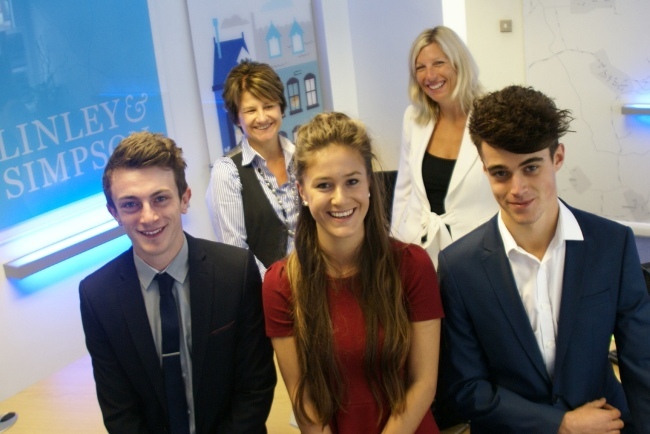 A Yorkshire residential sales and letting agency has said “you’re hired!” to its inaugural intake of apprentices. Linley & Simpson has recruited three new starters with the aim of equipping them with all the skills and knowledge required to pursue a successful career in the industry. Rosie Wilson, aged 19, will be based at the company’s office in Micklegate, York; Tom Sugden, aged 20, will hone his skills with the team at Princes Square, Harrogate; while Ed Simpson, aged 18, will work out of the Leeds city centre base at Swinegate. After securing the positions ahead of scores of applicants, they will spend a year at the award-winning company gaining a first-hand insight into the profession while studying for a NVQ Level 2 in either estate agency or letting agency. “This is one of a number of ways in which we are investing in the future,” said HR and Training Manager, Paula Ingham. “We want to support the pool of young talent that exists across Yorkshire – and train, mentor and mould them into become the letting or estate agents of tomorrow. She added: “They will receive hands-on experience of either the sales or rental side of our business, hopefully with a qualification to their name at the end of it. The independent agency, which employs more than 130 people, has an expanding network of ten offices across Yorkshire, including three in Leeds, Harrogate, Ripon, Wetherby, York, Wakefield, Ilkley and Saltaire. It first launched as a dedicated letting agent 16 years ago and made the “natural progression” of extending its expertise into the sales market at the turn of the year. Apprenticeships are designed to open up a new range of career opportunities and college leavers aged under 23 without a degree.